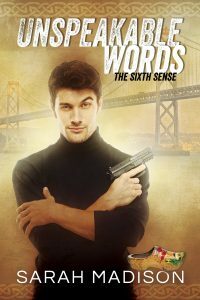 This entry was posted in Uncategorized and tagged announcements, book tour, Dreamspinner Press, gay romance, male male romance, new release, paranormal, promo, reviews, Sarah Madison, The Sixth Sense Series, Unspeakable Words, writing by Sarah Madison. Bookmark the permalink. Whooo-hoooo! Good luck with it, Sarah! Thank you! I *do* enjoy these guys so much!